Today early morning when I opened my In box two mails - MGR Fans Siva Shanmugam and Dubai K.P.Ramesh has forwarded these url's to me. A Happy News to MGR Devotees and MGR Fans, MGR to star in a brand new film. One of the most popular movie stars Tamilnadu has ever seen MGR is making a comeback to films. It would be an animation flick from the stables of Mayabimbham Media (P) Ltd who had earlier made the 3D film 'V4'. 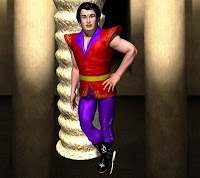 The 3D film starring MGR has been titled 'Puratchi Thalaivan'. The producers of the film have said that MGR had last performed in the film 'Maduraiyai Meeta Sundara Pandiyan' and proudly proclaim that they are bringing him back to the silver screen after all these years. 'Puratchi Thalaivan' would be directed by Venky Baboo and produced by Sridevi Rao. A team of 3D animators would indulge themselves in the job of recreating the magic of MGR on screen. One wonders who the animated heroine of the film would be. Would it be Saroja Devi or Jayalalitha. Who knows….the think tank behind MGR might prefer newer heroines like Trisha, Shriya or Nayantara. Chennai (IANS): Iconic actor and Tamil Nadu's former chief minister M.G. Ramachandran will compete with "current younger heroes" for screen space in a forthcoming animated 3D film "Puratchi Thalaivan"(revolutionary leader), its producer said Friday. "It involves a Tamil artiste and leader 'Puratchi Thalaivan' who saves the nation by fighting and exposing traitors. The film will help the late leader, popularly known as MGR, compete with 'younger heroes' such as Rajnikant, Kamal (Haasan), Vijaykanth, Ajith and Sarath (Kumar)," producer Sridevi Rao said. "The venture will present the grace of the evergreen MGR to the new generation with the latest methods of storytelling since his last official movie 'Maduraiyai Meetta Sundarapandiyan' (The handsome Pandiyan who retrieved Madurai) was released in 1978 - three decades back,"publicist Nikhil Murugan said. The work on the movie is well underway, he added. "Puratchi Thalaivan"is being directed by Venky Baboo. Produced under the corporate banner Mayabimbham, the venture's trailer will be released on January 17 to coincide with MGR's 92nd birth anniversary, a press statement added. MGR was Tamil Nadu's chief minister from 1977 till his death in 1987. He acted in 132 films (including two unfinished ventures which formed part of releases four years after his death) in a career spanning 43 years. In the evening after the close of play for the day, he came over to the hotel I was staying and I introduced him to our players and to the manager. He invited us for dinner, but we were unable to accept his kind invitation, as our program was already fixed by the Cricket board of Control. When we went to Madras, we were put up at the Victoria Hotel, Egmore. Here M.G.Ramachandran came and met us and invited all of us for a dinner at his Ramawaram Garden house. We all went and had a fine dinner. It was a memorable one for all of us. “M.G.R.” - he was popularly called and adored by millions all over, was the man of words and deed and I can’t forget about this gem of a person, with whom I happened to be in touch since for a very long time. Another interesting fact about MGR from Kamal superhit movie "Dasavatharam". Thanks to Pradeep Balu who forwarded these messages. 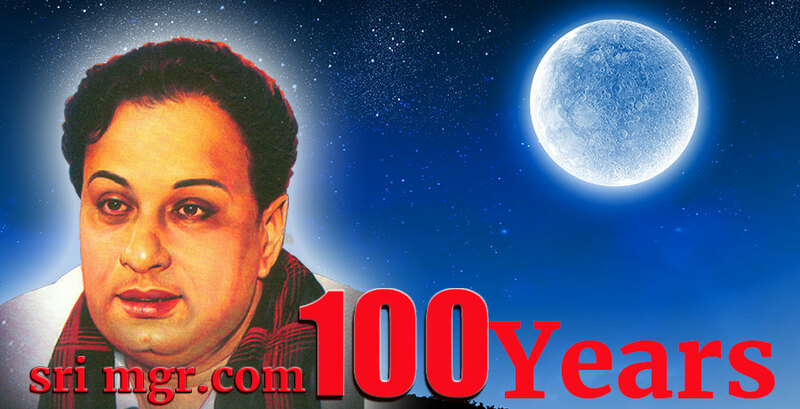 MGR Fan Murugan Dharmalingam has sent these two interesting web sites about MGR. These not only have infos but rare pictures of MGR with other leaders, behind the scenes etc. Did any Leader stood like this? before him and after him there is no body. 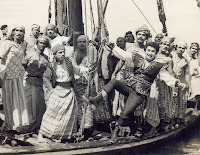 An unseen image from the movie Ayirathil Oruvan. MGR and his people. 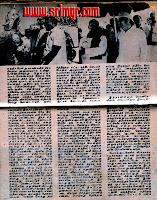 This image is taken when MGR became the Chief Minister and took oath in public. Anna Salai (Mount Road) June 1977. Nobody had such a charisma, people gathered to see MGR. 21st November evening there was sudden change in weather. By 6 pm an unexpected heavy rain I got in the middle the time was ticking I thought that I will not reach my home to join the Chat that was planned for the Virtual meet of Pradeep Balu with MGR Fans around the World. Some how I reached by 7 pm and opened our Blog and found that MGR Peran (Pradeep Balu) and Siva was online. The first to ask Pradeep Balu was Siva then one by one MGR Fans started to join the chat at one time there was 13 people in chat (And 3 guest unknown to me and they did not chat they were just spectators, one from Singapore, Malaysia and another Valley Forge California this particular person is visiting our Blog 2 to 3 times a day - Sir please tell about yourself). 1. Mr.Siva Shanmugam from Boston. 2. Mr.Abul Hassan alias MGR Visiree from Albany, New York. 3. Mr.Alagarsamy, Closest friend of MGR from 1972 - Chennai. 4. Mr.Cholan alias MGR Fan, Coubervile, France. 5. Mr.Yukesh Babu, MGR Devotee from Chennai. 6. Mr.K.P.Ramesh alias KPR from Dubai. Guests only answered which film they liked. And 3 guest who did not participated in the Chat. At one time KPR mentioned that he was the oldest person aged 38 to participate in the Chat but during Chat Abul Sir and Alagarsamy Sir came to chat and in this age they participated in Chat for the sake of MGR. It is a wonderful evening everyone enjoyed, Pradeep was telling about memories of MGR and MGC. The chat session at first looked confusing because number of questions was increasing and Pradeep found difficult to follow then KPR came in and made order. Thanks to him. After that the chat session was crystal clear to all and the questions were answered by Pradeep in ease. I thank MGR Fans who chatted all the way from United States such as Albany, New York, Boston, Dubai and France. And Pradeep Balu Grand son of MGR also thanked personally who participated in the Chat. I thank Pradeep Balu who allowed me to conduct such an online experience and who personally gave some technical advice and from his hectic schedule was online for 2 hours and 30 minutes and kept his cool whenever the questions were very personal. MGR Directed Movie Ulagam Sutrum Valiban reaches 6th week and going strong. These are ads from various places from Tamil Nadu. 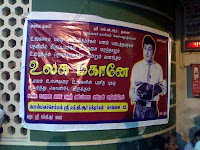 MGR's first Chief Minstership constituency Arupukottai, the movie is realsed in Rani Dts. 2nd Successful week in Tutucorin Mini Raj. Ulagam sutrum Valiban successful in 85 centres. Images forwarded by MGR Devotee Yukesh Babu. MGR movies greatest on screen foe M.N.Nambiyar who was very attentive in his roles and had fast reflex who aptly balanced MGR's performance in Action scenes, he was the likeable Villian for MGR Fans. 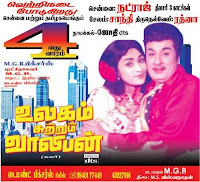 MGR and M.N.Nambiyar first combined performance was the first MGR Hero role movie Rajakumari in this movie M.N.Nambiyar acted in comedian role and as a friend to MGR. But the future was not like that, Nambiyar Samy was opposite to MGR in Social and as well as in Historical movies. The best role for Nambiyar Samy to me is two movies one in Sarvathikari and second is Ulagam Sutrum Valiban. The fight in both the movies is best in their combination. I have uploaded two video clips this clip is the one liner between MGR and M.N.Nambiyar in Ayirathil Oruvan. How people ecstatic when MGR and Nambiyar performs stunt in Ulagam Sutrum Valiban watch for the fight and enjoyment of the people. This is also from Ulagam sutrum Valiban and last scene of Nambiyar. The poll in our blog that who was the best Villian for MGR, 80% of the people choosed him, that was our Love to Nambiyar Samy. MGR Fans and Devotees pray for his soul to rest in peace. One MGR Fan has commented to post about Madurai Meeta Sundarapandian. I searched my collection and contacted MGR Fans having collection about Madurai Meeta Sundarapandian and here the post. The film was started in the year 1974 by the then Director and Producer B.R.Panthalu. Later after his death MGR took up the Direction part and new producer Sokkaiah (Soliswar Combines). 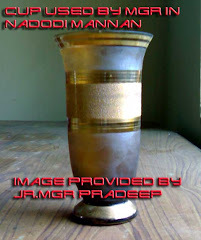 The story is by Akilan, Gnanapida award historical story "Kayalvizhi". The story was not changed in the movie. 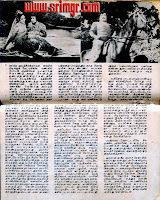 This article is from "Pesum Padam" published in January 1978. The article was written by Chitra Krishnasamy He narrates how the movie was taken in Jaipur and the obstacles faced during the shooting and interesting information about the location. The very interesting matter is 5 Directors and technicians combinedly worked for this movie for the climax scene. They are P.Neelakandan, K.Sankar, Karnan, Sekar (Telugu Director) P.Ramasamy (Malayalam film camera man) and Shanmugam (Camera man). The video clip of the climax scene with many cameras will be posted in next post. Another interesting fact is the journey from Chennai to Jaipur and what they took with them for the shooting. Chitra Krishnasamy continues with the location part and how the Maharaja of Jaipur treated them and how they helped in shooting of Madurai Meeta Sundarapandian. The three songs from the movie such as MGR philosophical song and two duets one with Padmapriya and one with Latha and how they managed to change the location that was not noticeable in the song the first part of the song was taken in Jaipur palace and the last part of the song in Samoth palace. Thanks to Mr.D.Venkatesan Hardware Merchant, who painstakingly collected these informations for our blog. Ulagam Sutrum Valiban release response in Natraj was overwhelming the ticket cost is Rs.12 and Rs.15. The Theatre does not have DTS and the songs were missing the tempo but still people liked it. The collection is above Rs.1 lakh for 1 week. Ulagam Sutrum Valiban reaches 5th round in Tamilnadu. Murugan Dharmalingam MGR Devotee has sent this url to me. CHENNAI: “Between Jackie Chan and MGR, I will go for MGR,” declared UNICEF official Kunihiko Chris Hirbayashi to members of the audience who are momentarily undecided whether to applaud or laugh. It is moot that by the time he finished his cameo speech at the launch of a two-day workshop on maternal and infant mortality on Thursday, they had indulged in both, in ample measure. For Mr. Hirbayashi, both Jackie Chan and M. G. Ramachandran were terrific actors who had pulled off some of the most amazing stunts on screen. But, unlike Chan, MGR plunged into politics to eventually become a Chief Minister, who made a huge difference to the lives of the masses, he said. Thanks to Murugan Dharmalingam for forwarding the url and message. As I was busy preparing for the chat session of Pradeep Balu (Grandson of MGR) I sent a mail to Abul Hassan of Albany who settled in US right from 1980, about the chat. He forwarded the latest issue of Junior Vikatan an article about Director Sridhar. I have posted the image in our blog, forwaded by Abul Hassan also known as MGR Visiree the content is drilled down to MGR specific matter. How MGR helped Director Sridhar. Ulagam Sutrum Valiban was re-released in Natraj theatre on 7th November 2008. On Sunday for the 6.30 show it was full and the House full board was fixed by 4 pm. The theatre had a festive look. There was notice by Yazh district MGR Rasigarkal of 1973 I have produced it in our blog. Watch it. There was lot of vinyl boards by Kalai Venthan MGR Bakthargal. Venkat has kept placards which was breathtaking it will be posted in future. 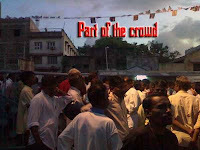 The crowd was thronging the movie hall and Police protection was given. I and Yukesh Babu find difficult in taking the video and to find a right place, for the first video we had problem and the crowd was pushing us from behind we went to safe place for the video. This is the video clip showing the record crowd entering the movie hall. It took 10 minutes and 4 police men to control the crowd. Ulagam Sutrum Valiban on successful 4th week. These are the theatres showing Ulagam Sutrum Valiban. Images forwarded by MGR Devotee Yukesh Babu. The song is shot entirely in Expo 70. All the major pavilons are included in this song. Having more than 200 shots (the most number of shots for a song). Enjoy. This Week the movie is screened in Natraj, Chennai. The collection details from Trichy and other centres will follow soon. First time a tamil Movie (35 years old movie) to be released in latest movie format. Name of the centres click to read. Watch for the camera technique and the new sound effects added. For information this scene is for MGR's camera technique, everybody skated but MGR did not he made it appear like he did the skate, he already skated in Anba Vaa. Amazing scenes done by MGR the Director of Ulagam Sutrum Valiban. All sort of fight technique used in this climax scene. Thanga Regal Theatre Madurai, with Autorickshaws. The first people who throng MGR movies in Tamilnadu. Anaithulaga MGR Pothunala Sangam of Madurai Branch R.R.Manohar (Marmayogi Manohar) forwarded the photos and posters to me through Sathya. MGR Directed movie Ulagam Sutrum Valiban with DTS was released in Madurai Thanga Regal on 17.10.2008. These are the images taken before the first show of the movie. 7 cut outs with garlands. 4 tiers to 6 tier garlands are placed over MGR. Image showing the number of theatres and the number days for the first release of Ulagam Sutrum Valiban. The movie was screened for 13 days and collected above Rs.4 lakhs. And the last show collection was Rs.20,000 thousand. Thanks to Marmayogi Manohar for forwarding the images and the collection data. 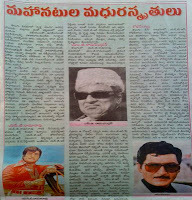 Makkal Thilagam MGR, N.T.Rama Rao and Shoban Babu an article in Vartha Telugu daily. Thanks to Grandson of MGR who forwarded this news to me through phone. Those who know Telugu can forward the word to word translation to our Blog viewers. Previously I have posted about MGR movies making history in Tutucorin. 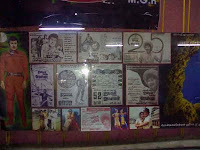 MGR movies are re-released in almost all parts of Tamil Nadu. Not only the then Box Office movies average movies are also re-released with support from the MGR Fans and as well as movie lovers. 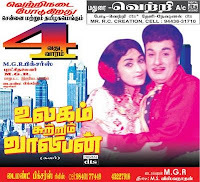 To create a Guinness Record for re-releasing 100 MGR movies, Tuticorin Sathyam Theater was regularly re-released MGR movies continuously from 4.3.2007. Only on Sunday three shows and some movies for one week. Recently Kumudam Reporter have given this two page story. The success of MGR re-release movies is highlighted in 2nd page 3rd para. 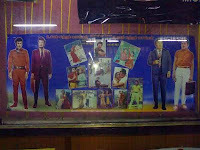 Difference between MGR movies re-release collection and other new movies re-release are also included by Balakrishnan. Thanks to Kumudam Reporter, K.P.Ramesh, Sathya and Yukesh Babu. These are some of the movies released in Sathya Theatre.